We caught your attention with the run down of our signature events at Winter Carnival. We sweetened the deal with a panoply of warming activities. Now we hope to reel you in with our latest dispatch: food. That's right, not only will Bank of America Winter Village be aglow with curling and brew house galore, but there will also be delicious food for purchase thanks to our friends at Hester Street Fair. Take a look at some of the tempting options below. 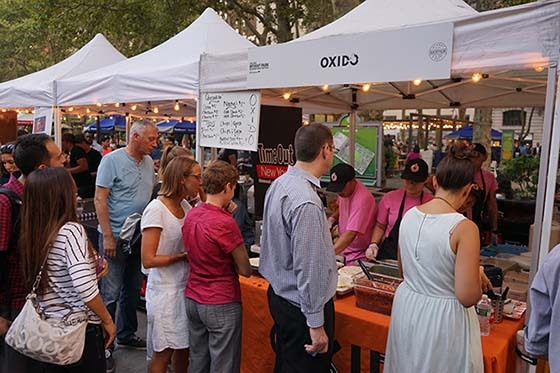 Returning to the park after delighting movie-goers at our HBO Bryant Park Summer Film Festival, Óxido serves up a modern take on traditional Mexican fare. They hold a high standard for their burritos and tacos which means only the freshest produce and spices make their way into your order. These delicious bites are also made from scratch, so you know there's a little bit of love in every bite. You can't go wrong with the chili lime pork carnitas! Inquisitive guests peruse the Óxido menu at the HBO Bryant Park Summer Film Festival. What better complement to the winter spirit than a hearty cup of soup? 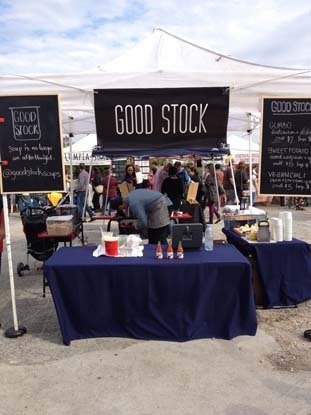 Our friends at Good Stock believe that soup is the ultimate comfort food, and we don't disagree. Rather than as a side or a pairing with other dishes, Good Stock takes soups to the forefront using high quality ingredients and, well, good stock to create warm cups of joy that stand alone. Be on the lookout for their white bean, kale, and sausage soup as well as the roasted sweet potato and apple soup with hints of curry. They've also got a spectacular roasted tomato for fans of the classics. Good Stock at Smorgasburg. Photo via their website. Arancini Bros. are no strangers to the urban street-food circuit, having had booths at both Broadway Bites and Penn Plates. The Arancini Bros. specialize in deep fried risotto balls, pulling from a history of Sicilian cooking to produce time perfected classics such as the ragu arancino filled with pork ragu and green peas. These morsels strike the perfect balance between crisp exterior and gooey tender interior making for a heart warming gastronomical experience. Perfect for a post-Skating Showcase snack. Creamy, crunchy, and warm. Photo from Arancini Bros. website. It wouldn't be a Winter Carnival without our friends at Wafels & Dinges. Having heeded the call of the dinge-hungry masses, Wafels returns to Winter Carnival bringing along some of our favorite Belgian treats. The team will be hawking authentic Liege waffles along with their famous "speculoos" cookie butter spread and a variety of other scrumptious toppings. If you swore off sweets as a part of your New Year's Resolution, they also have a variety of savory options. 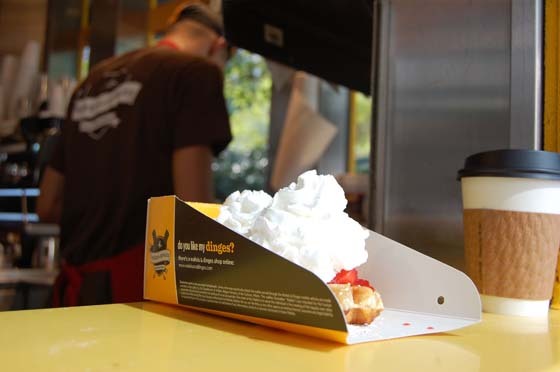 Wafels & Dinges currently operates a year-round kiosk at the north-west corner of the park, perfect for when you have cravings outside of Winter Carnival.